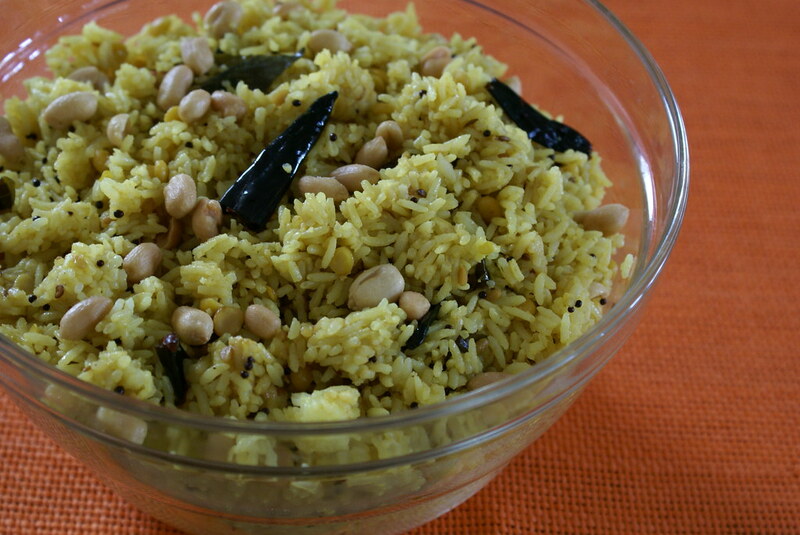 Pulihora, Chitrannam or Tamarind Rice.. all refer to the same dish, a rice delicacy prepared using tamarind. This is the one dish which is prepared on any festival. It doesnt need a special intro to many South Indians esp., to those from Andra, Karnataka and TamilNadu; though the name and the taste differs slightly from state to state. To Kannadians it is Puliyogare and to Tamilians it is Puliyodharai. It is even served as prasadam in many temples. It was so often made during festivals or during outings that my father sometimes used to make fun saying that it is a default menu in our households; for festivals it is pulihora and payasam, and for outings it is pulihora and perugannam(daddojanam). This is the recipe from my mom, and never goes wrong. Boil Rice, along with Chana dal, adding little salt and oil. Keep aside for further use. Heat oil in a kadai and add red chilles, urad dal, cashews/groundnuts, mustard seeds and cumin seeds. Fry on medium heat till seeds splutter. Add haldi, hing, green chilles, curry leaves. Fry for few more mins. Add the tamarind paste, and salt. Let is cook for 5 mins. Take out from heat and mix it with the cooked rice. Delicious. And perfect for any occasion. This was my favorite from my childhood and still remains the favorite. It can also be prepared using Lemon or Raw Mango, instead of Tamarind. It depends on an individuals taste buds, as how they like it. It is a traditional Andra recipe, and a must try for everyone! This is my entry for the RCI – Karnataka event being hosted by Asha of Foodie’s Hope. Pulikachal (as we call it) is absolutely yum – its a dish on the side for almost everything in our house. It looks yumm. i love rice dishes. Uve got some pretty interesting and simple recipes here…nice blog!! That looks very good Cinnamon. Good to have you back. This is one of my favourite rice dishes. tangy and filling….feeling digging into it. Its raining puliyodharai everywhere Cinnamon. I have gotta try this! Even my favorite too. Looks lovely dear. Thanks for sharing. 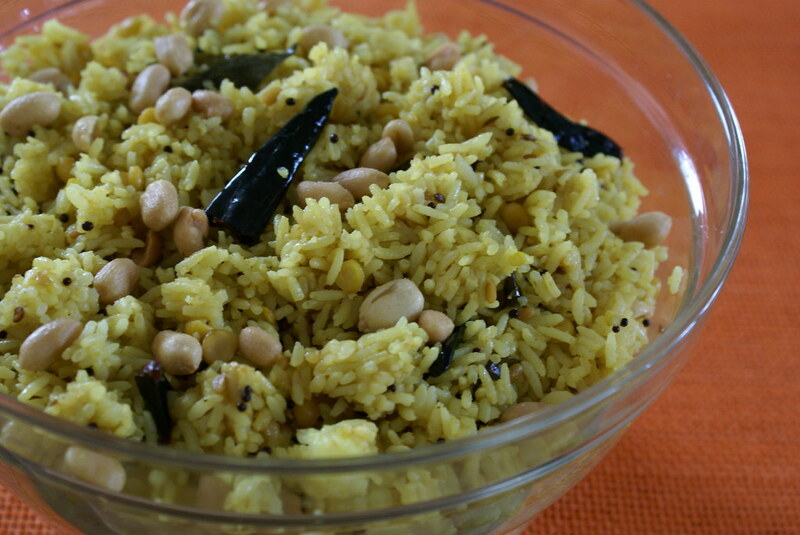 i love puliyodharai…urs looks delicious! This looks very different from the Iyengar Puliyogre that I make at home which is usually dark brown in colour. But the taste of Pulihora given as prasadam at temples in Hyderabad still lingers in my memory. Am going to give it a try! lot of puliharas in blogsphere for RCI. looks yum. Rice looks nice. i had this rice once at a temple .Good RCI entry. I tried this a couple of days ago. It was fabulous. Hubby and I both clean finished the dish. It’s commonly made in my in-laws’ home, but was never made in my mum’s house. It’s a fairly simple dish, and yet it’s very very tasty. do u chop the green chillis?